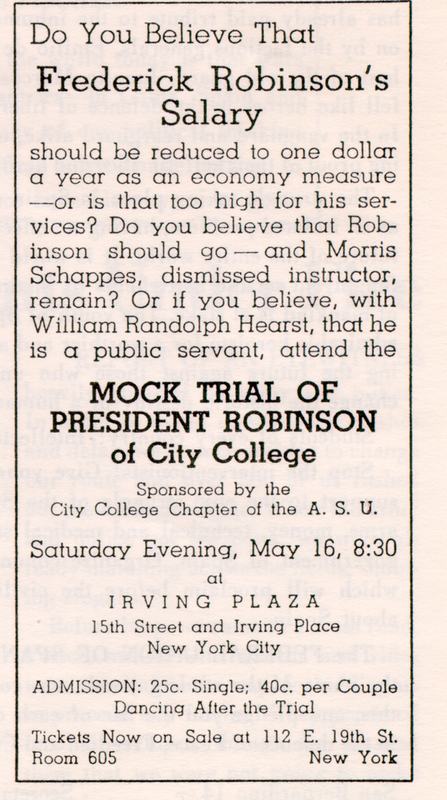 This clipping from The Student Advocate advertises a student-run mock trial of City College President Frederick B. Robinson at Irving Plaza on May 16, 1936. The trial centered on the recent firing of CCNY Professor Morris Schappes. Schappes, an English instructor, was dismissed on April 22nd after speaking on behalf of the faculty-organized Anti-fascist Association at an anti-war rally on campus. CCNY's undergraduate paper, The Campus, reported several days after the mock trial that a student jury acquitted Schappes after deliberation of "one one-hundredth of a second." The event saw several students appear as witnesses on behalf of Schappes, with others speaking against President Robinson. The student paper reported 1,500 students in attendance at the event which was sponsored by CCNY's chapter of the American Student Union, a national left-wing organization of students. Cite This document | The Student Advocate, “Advertisement for "Mock Trial of President Robinson",” CUNY Digital History Archive, accessed April 18, 2019, http://cdha.cuny.edu/items/show/3992.